EarlsHelpDesk.com | Remote Access Computer Services – Professional. Affordable. Confidential. Guaranteed. Hi. I’m Earl Chinnici. Welcome to the help desk. 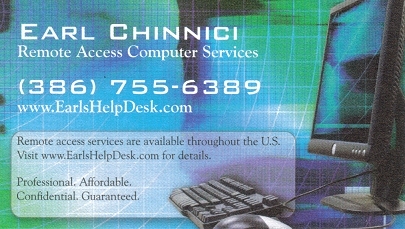 I offer many computer services through the use of specialized remote access software. This software allows me to control the mouse and keyboard input of a client’s computer almost as if I were sitting at the computer. In turn, this allows me to extend my help and maintenance services to nearly anyone that has a relatively high-speed Internet connection and a phone. This method of computer services has many advantages . Imagine not having to unplug all those wires and haul your computer to a local technician each time your computer is in need of repair. Imagine not having to call a squad of geeks or a bunch of nerds to come to your house every time you need help with your computer, not to mention the bill. I could go on and on. The services I offer include virus and malware removal, computer maintenance, troubleshooting, repair of software issues, general computer tutoring, software installations and uninstallations, customization, and personalization of Microsoft Windows, help with practically any Windows-based program, and much more. To begin, please read the Service Agreement, and then call the help desk. I am certain you will love the quality of service and affordable prices. Don’t just take my word for it, see what others have said. Some materials for this site are submitted by others. Earl Chinnici does not necessarily share the opinions of guest contributors and guests do not necessarily endorse this site, although some will. Some guests may also write material which is not suitable for all ages. Please use discretion when following links. Remote Access Computer Services – Professional. Affordable. Confidential. Guaranteed.